After my discussion about wasting less and enjoying more, I wanted to bring you a way to make basic reusable bags. I make these simple cotton bags for filling with grains, beans, nuts and seeds from the bulk bins at the store where I shop. I have found that it is usually less expensive to buy from bulk bins than to purchase the same items already packaged. Filling reusable cloth bags means I waste even less. When you purchase from bulk bins, you simply fill your bag and then make note of the product number. Many bulk aisles have twist ties or stickers you can write this number on so that the cashier knows how to charge you. I sometimes use (and re-use) twist ties around my fabric bags. You can also write the number right on the fabric, or have dedicated bags for items that you buy regularly which are labeled with the number of the product. Most bulk aisles have a scale which you can use to figure out the weight of the bag. This is called the TARE and if you let the cashier know, they will subtract it from the weight of the product. Once you have tried it, it is a very simple process. If you have further questions, I’d be happy to answer them in the comments or you can ask your friendly grocery store employee. These bags also work well for transporting fruits and vegetables, although since they aren’t air tight, they aren’t ideal for storing perishable produce for several days in the refrigerator (but maybe that isn’t important). I also wouldn’t recommend them for flours and very fine grains that can leak through the fabric. Still, they are a perfect solution for most bulk foods. It may seem like there are a lot of steps but they are all really quick, I just wanted to give as thorough an explanation as I could. You can make the bag even simpler by leaving out the drawstring. I think the drawstring is handy, but it is really not necessary for produce or if you are going to use a twist tie. They are easily washable so you can use them again and again. 1. Fold and measure your fabric. You can make the bag any size you would like. I make all of mine about the same size so I can use them for anything, but you could make some larger and some smaller. 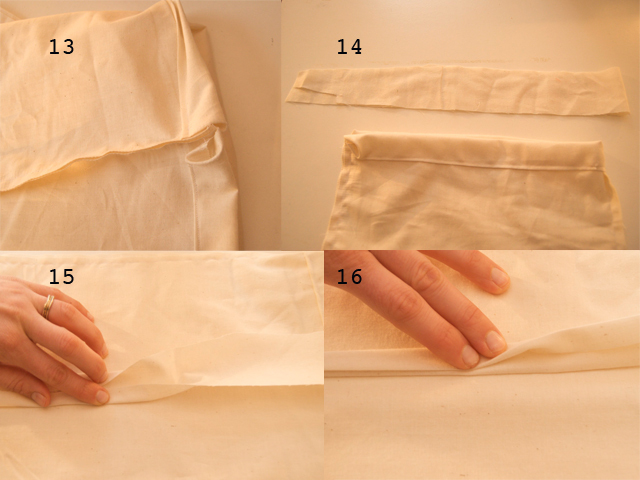 Before you cut, fold the fabric over so that the bottom of the bag is a fold. You will sew the two sides. Folding it makes it easier to cut. I measured a rectangle about 11 by 14 inches. 2. Cut the fabric. The two sides and the top will be cut edges, the bottom of the bag will be where the fabric is folded. 3. I add applique to some of my bags. Here I cut out a carrot. You could add designs to your bags to indicate what you will using them for, or just keep it simple. 4. 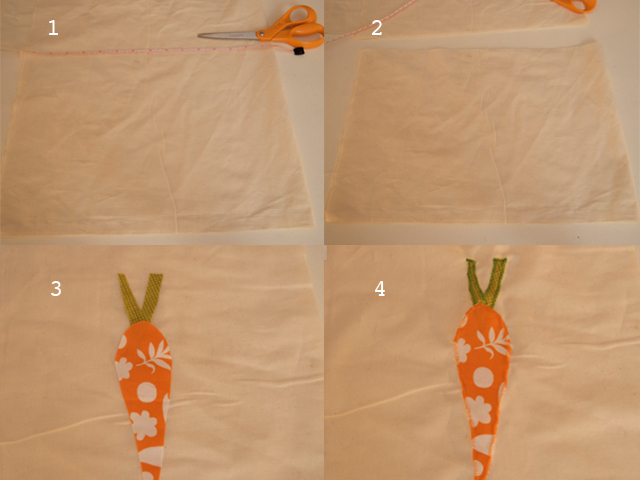 I appliqued the carrot to the front of the bag. 5. Now you will prepare to sew up the sides of the bag. Turn the fabric so the right sides (which will be the outside of the bag) are together and line up the top and sides of the bag. If you do not want a drawstring, simply sew along each long side of the bag, leaving about a half inch of fabric between the edge and the seam. If you want to add a drawstring, you will sew all the way on one side (with the same distance from the edge to the seam as above). On the other side you will sew from the bottom of the bag and stop about 3 inches from the top of the bag (where the opening will be). 7. If you are making the drawstring, you will now have one side of the bag where the fabric is not stitched all the way to the top. 8. For the drawstring, starting on the side where the fabric is not stitched all the way, fold the top inch of fabric down and then fold it over again. 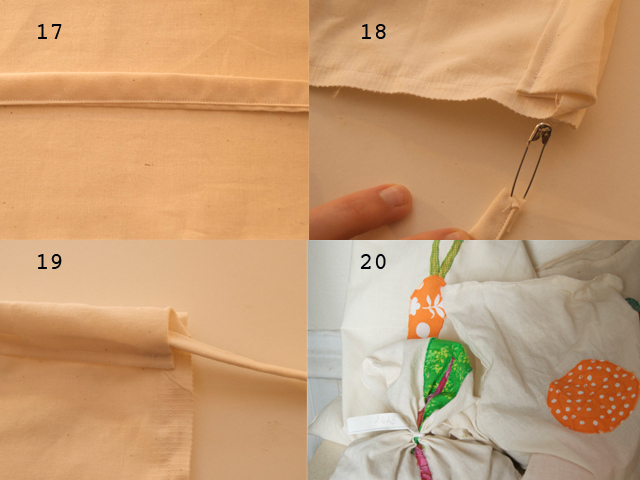 Pin it all the way around to form a band of fabric at the top of the bag with no cut edges showing. 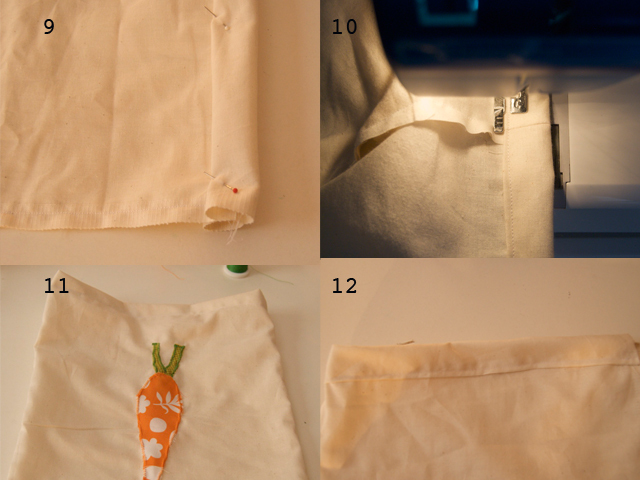 If you are not making a drawstring, then fold the fabric at the open top of the bag over twice and pin it in place. This will create a finished edge which you will sew around. 9. At the open edges of where the drawstring will go, fold the cut edge of the fabric in, hiding the raw edge. 10. 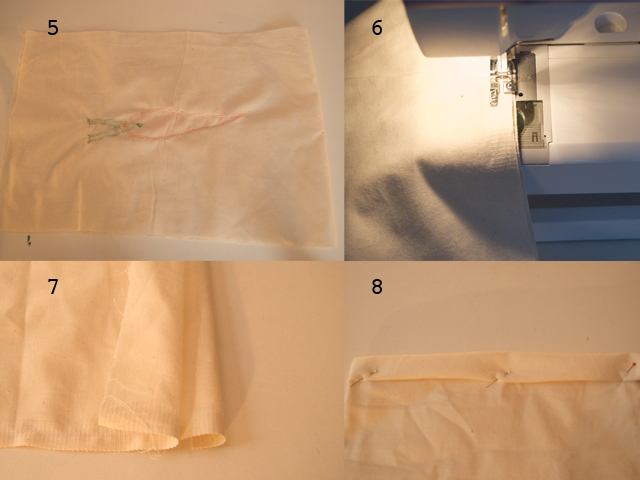 For the drawstring bag, sew around the band of fabric, keeping the stitching just above the bottom fold of the band. This will create an open space for the string of the drawstring to go through. For the open top (non-drawstring) bag, sew around the folded open edge of the bag to create a finished top. 11. If you are not making the drawstring bag, your bag is finished and ready to use. 12. 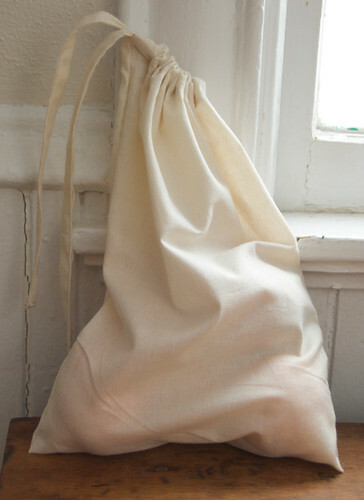 If you are making the drawstring bag, you now have the space that the string will go through. 13. This is what your opening for the string should look like. 15. Fold the raw edges of the fabric strip into the middle and press flat with an iron. 16. Fold the now folded outer edges of the strip into the middle and press flat with an iron. 17. 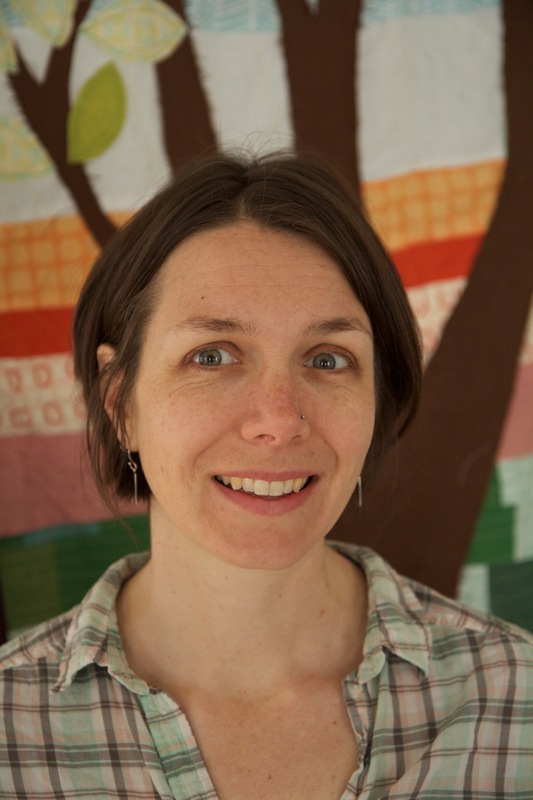 Sew along where the folded edges meet to create a solid strip of fabric with no raw edges. 18. Pin a large safety pin to the end of the fabric strip (which is now the string for the drawstring). Feed the pin through one of the holes which will hold the drawstring. Use your fingers to scoot the pin and fabric strip all the way around until it comes out the other side. 19. The drawstring is now ready to use. 20. Don’t forget to take your bags with you when you go to the store or farmer’s market. If you have any questions or any of the steps could be clearer, please ask away! The bag is great. Perfect for the market. Thanks for the tutorial! Wow! Thanks. This looks like a great project. I'm imagining that old pillowcases (with some good wear left) might supply the fabric. Thanks! 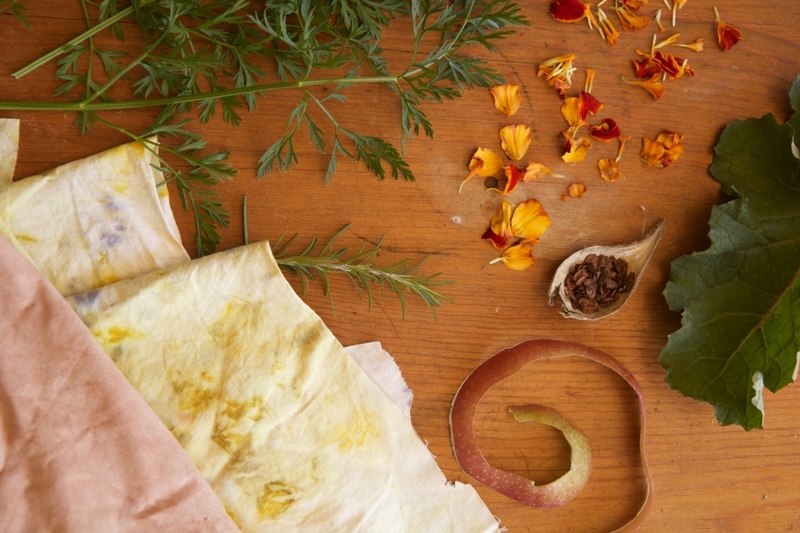 Pillow cases sound like a great idea, nice way to reuse something and get lots more life out of it. Let me know how it goes! I will! My household is down with a bit of a stomach bug now, so I probably won't get to sew for a little while. When I do, I will write a blog about it and link to your tutorial.